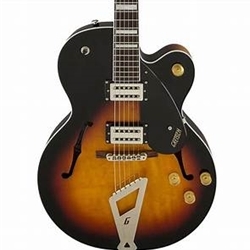 The Gretsch G2420 Streamliner Hollowbody electric guitar was built for players looking for an affordable archtop guitar that is as comfortable offering the identifiable Gretsch sound as it is higher-gain rock tones. The floating bridge and fully hollow construction are great for smoky jazz tones. And the two custom-wound Broad'Tron humbucking pickups offer a powerful voice with balanced lows, mids, and highs. The Gretsch G2420 Streamliner is a wonderful blend of old-school personality and new-school tonality at an amazing value. Gretsch's G2420 Streamliner Hollowbody plays and feels every bit as good as it sounds. Its thin "U" neck profile is round enough that chording remains comfortable in all positions, while being thin enough to facilitate fleet-fingered runs. The full-size, single-cutaway construction is comfortable against your body, and it gives you access to the guitar's higher frets. The controls have even been thoughtfully laid out to pull a wide range of tones from the guitar.